Following an indefinite leave of absence, and at the request of five major investors, Uber Chief Executive Travis Kalanick has resigned —but will remain on the board of directors, and still owns a majority of the company's voting-eligible stock shares. "As you all know, I love Uber more than anything in the world, but at this difficult moment in my personal life, I have accepted a group of investors' request to step aside, so that Uber can go back to building rather than be distracted with another fight," said Kalanick in a statement. "I will continue to serve on the board, and will be available in any and all ways to help Uber become everything we've dreamed it would be." According to The New York Times, pressure on Kalanick to completely resign as CEO came from venture capital firms Benchmark, First Round Capital, Lowercase Capital, Menlo Ventures, and Fidelity Investments. The five groups control about 40 percent of Uber's voting bloc. Kalanick's departure was motivated partly by the company's problems, but also by the recent death of his mother in a boating accident. Uber has been dealing with multiple sexual harassment and discrimination claims, which have led to the firing of more than 20 employees. In an additional debacle, Uber collected UUIDs of iOS devices with the hailing app in violation of App Store policies, hoping to cut back on new account promotion fraud. Kalanick and Apple CEO Tim Cook feuded about the tracking —as Uber was not forthcoming about it after being confronted. A probe of the company, led by U.S. Attorney General Eric Holder, resulted in reform recommendations for Uber, including implementing a board oversight committee, changing corporate values and culture, serving less alcohol at official events, and instituting a prohibition on intimate relationships between "rank and file" employees with executives and supervisors. As an immediate result to the probe, the board fired Senior Vice President of Business Emil Michael who suggested that Uber should build a team to investigate journalists and organizations critical of the company. 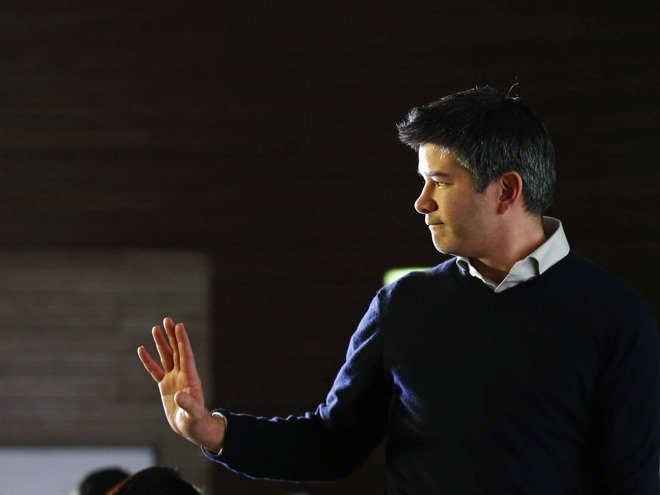 "Travis has always put Uber first. This is a bold decision and a sign of his devotion and love for Uber. By stepping away, he's taking the time to heal from his personal tragedy while giving the company room to fully embrace this new chapter in Uber's history," said the Uber board of directors in a statement about the depaarture. "We look forward to continuing to serve with him on the board." Uber recently hired Apple's former head of Global Marketing for Apple Music and iTunes Bozoma Saint John to serve as a "chief brand officer" and will face the task to reform the company's public image.